Google Analytics can be overwhelming sometimes and as proof Google itself built a dedicated Google Analytics Academy to make sure users understand all of its functions properly. But why follow complex courses and assimilate enormous amount of raw data, when you can track, manage and view all the important data right in the back-end of your website? Running a website is very common these days. Whether you are doing business or for individual use, having a website is a must. With today’s amazing technology, it has become fairly easy and accessible for people to make and manage a website. What is the next step after launching your personal or business website? Thanks to search giant Google, you can list your website to search engines and open a new door through which visitors will come to your site. Luckily, Google provides a powerful traffic monitoring platform known as Google Analytics. You might already know about it and also know that Google Analytics is very complex. It captures a lot of data and processes it for you. Google Analytics also helps you by displaying that data in a dashboard. From there, you can learn about the traffic volume, it’s source, referrals, user base, demography, behavior and much more. Interesting, right? However, the truth is – you cannot always understand this data that Google Analytics displays and sometimes it’s really difficult to find out the exact information that you want to know about. So what can you do to help us makes sense of it? If you are a WordPress user (people who have built their website using WordPress), then we have good news for you! There are numerous plugins that can solve almost any problem you encounter. This is one of the major benefits of WordPress and the reason why it is the number one content management system on earth. So, how amazing would it be to get your own Google Analytics Dashboard available in your website’s admin panel using a WordPress plugin? Yes, no kidding! It really is possible! All you have to do is – install an easy to use and also a useful plugin, Analytify. Most importantly, you can download it for FREE from WordPress.org. Installing this super amazing plugin is as simple as any other plugin. Simply head to your plugins menu and click Add New. In the search box, type ‘analytify’ and voila you will find your desired plugin. Hit the Install Now button and then Activate. After installing, you will be able to track your web traffic like a pro directly from your website. But before that, you will have to integrate Google Analytics with Analytify. Luckily, Analytify has an excellent UI that allows you to easily set it up even if you do not have previous experience with analytics tools. The system will ask you to connect your website with Google Analytics. When you agree, you will be asked to log in with your Analytics account. It’s simple as that. And from now on, you will be able to view all your web traffic right from your WordPress Admin Dashboard. Now that you have set it up let’s see all the awesome benefits that having a WordPress Google Analytics Dashboard such as Analytify on your website brings you. When you are considering a solution for your website, the first thing that you might think about is the cost. Well, Analytify has a FREE version and it provides some amazing features even for a free plugin. However, there is also a PRO version with advanced features that every blogger and business needs in this modern era to understand their visitors. If you have used Google Analytics before then you already know how its Dashboard looks. There are many different types of data that give you insights about your website. However, this huge amount of data can easily confuse you and unless you have sufficient experience using it finding the exact data that you are looking for will prove to be a challenge. So, it is very tricky to put together all the important information in a single dashboard. You will either have to check multiple pages or generate different views to learn more about your traffic. What Analytify does inside your WordPress dashboard will prove to be very useful for anyone. It generates an insightful dashboard with all the important data you need. And the best part is – you don’t have to visit Google Analytics for that. You will get all the stats and it will be updated automatically. If you use Analytify, you will be able to get some very useful charts that will represent data in a more familiar way for you to understand. 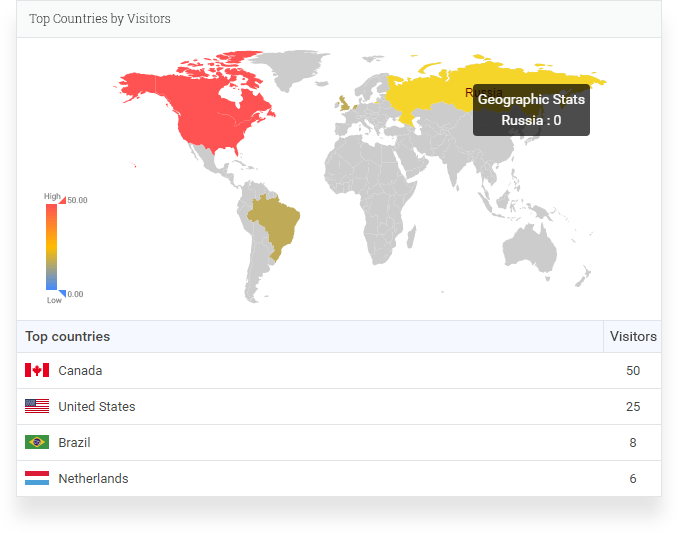 For example, you will get a nice world map showing all your traffic coming from each country. Not only that but there are even more graphs that might help you significantly. Basically, you can understand your complete user base and demography more easily. All this can be very difficult using Google Analytics Dashboard directly. This feature is really amazing as you don’t have it in Google Analytics. Analytify makes it easier for you to understand the traffic of each and every page and post that you publish. You can find general statistics for your pages right in your admin panel. You can even filter stats by date. This is very useful for finding out traffic information for your pages/posts. Not only that, you can find out about the traffic source, keywords, country, language and a lot more. Well, this is available in Google Analytics, however, you can get that on your WordPress dashboard as well. This is an important feature that everyone needs. As you are bringing all the good stuff of Google Analytics to your WordPress site, why not bring this feature as well? It’s common for a blogger or a business owner to run various campaigns on their sites. You may also have active campaigns that you are running and tracking them using UTM links. If that is the case, then Analytify has got you covered as well. 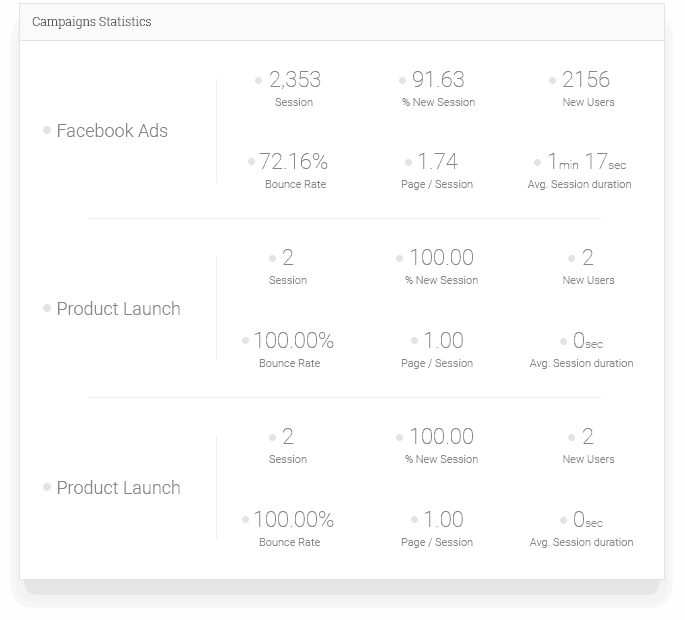 It will let you track your campaigns easier than ever. Social Media Stats? No Big Deal! Sounds cliche, but it’s true. You can also get social media stats right on your WordPress backend. By social media, here we are indicating the campaigns that you run over various social networking sites like Facebook, Twitter, LinkedIn etc. This means you get to know from which social media you are receiving traffic and which ones need more attention. It’s pretty handy to shape your social media game properly. Analytify is capable of creating great reports for you and your team, however, if you get the reports on the frontend, how would that feel? Cool, right? 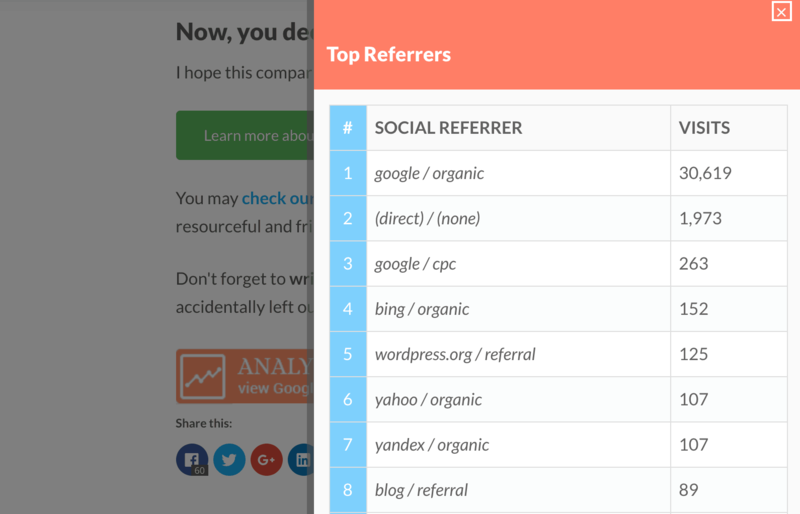 You can generate frontend traffic reports for your pages and posts. 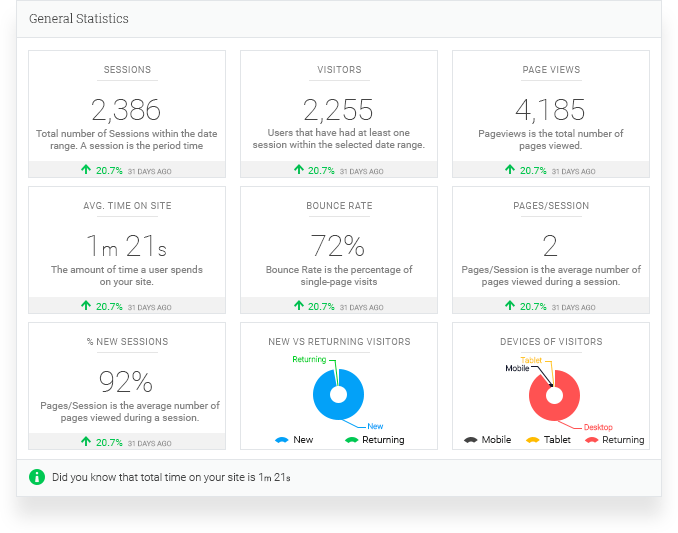 This page-level analytics feature of Analytify makes it worthy enough to be praised as one of the best Google Analytics Dashboard Plugins for WordPress. You can also view advanced data analytics directly from the frontend of your page or post. If you are running an eCommerce Store, you can easily get an overall understanding and advanced view of your traffic. 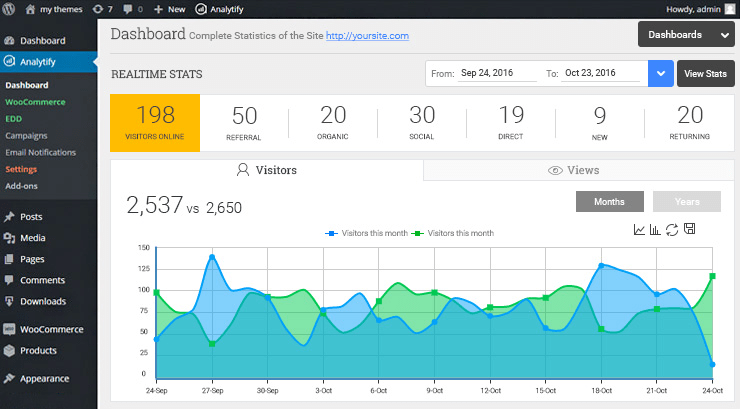 Analytify has WooCommerce and EDD extensions that allow you to measure your traffic easily. 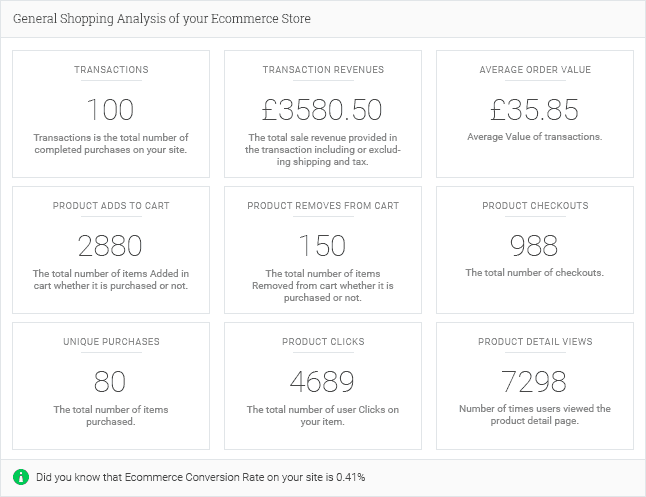 You can view very useful and important data for your eCommerce store via Google Analytics on your WordPress Dashboard. You might say that you can view it from WooCommerce/EDD reports. However, getting all this important information out of the box on a single page is very time saving and efficient. They also have a PRO version and it’s not very expensive. Analytify PRO can be purchased for just $39 for a year! There are some other bundles and packages as well. Check out the pricing details here. Besides that, according to WordPress.org – Analytify has 20,000+ active users and has been downloaded around 198,850 times. Most importantly, it has a rating of 4.8 out of 5 stars. 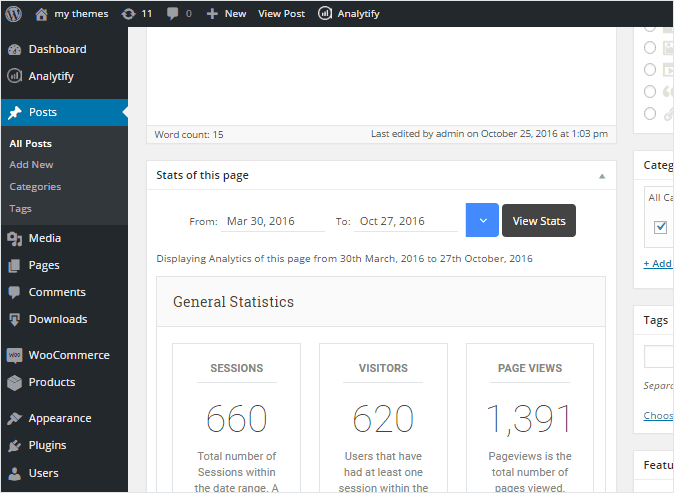 This means Analytify is popular among WordPress users and also has enough good reviews to be called a good WordPress plugin. Just Be Aware: How Much Does a Small Business Website Cost in 2018? Published on July 3, 2018 by Peter Hughes. Filed under: analytics, woocommerce. Definitely, a nice to have simplified version of your traffic data on your WordPress dashboard.